Burgundy is a dark red color associated with the Burgundy wine of the same name, which in turn is named after the Burgundy region of France which in turn is named after the ancient Burgundians, a Germanic tribe. The color burgundy is similar to other shades of dark red such as maroon, cordovan, and oxblood, but differs from each of these in subtle ways. For example, cordovan with its origin in equine leather used for shoes has a slightly fairer, lighter brown color whilst oxblood, typically used in description of clothing, in particular leather, has both a much richer red and a little more blue. When referring to the color, "burgundy" is usually not capitalized. The first recorded use of "burgundy" as a color name in English was in 1881. 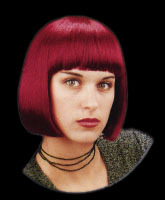 In cosmetology, a brighter tone of burgundy called vivid burgundy is used for coloring hair. At right is displayed the color old burgundy. The color old burgundy is a dark tone of burgundy. The first recorded use of old burgundy as a color name in English was in 1926. The burgundy color was the most popular lipstick color amongst women in the 1990s and early 2000s. It is also a popular lipstick shade with the people of the goth subculture. In recent years it has made a comeback as popular lip color in the high fashion industry. The color is used in the name of the titular character of the 2004 comedy film Anchorman: The Legend of Ron Burgundy and its sequel, Anchorman 2: The Legend Continues. The name is given because the character often wears a burgundy-colored suit. The Duke of Burgundy is a 2014 movie the central character of which is a professor of butterflies, the Duke of Burgundy being a species of butterfly. Burgundy is a popular color for sheets and pillowcases. Roger Cichy's final movement of the series Colours is named Burgundy Red. The second track from Earl Sweatshirt's debut studio album Doris is titled "Burgundy". Venezuela's athletes traditionally wear burgundy uniforms in international competitions. This practice has earned them the nickname "Red Wine". Burgundy, along with gold, is one of the trademark colors of the National Football League's Washington Redskins. Burgundy, along with blue, is one of the trademark colors of the National Hockey League's Colorado Avalanche. Burgundy is the primary color of Major League Soccer's Colorado Rapids, used with white, sky blue, and "onyx," a dark grey. European Union passports have a burgundy-colored cover. ↑ The color displayed in the color box above matches the color called burgundy in the 1930 book by Maerz and Paul A Dictionary of Color New York:1930 McGraw-Hill; the color burgundy is displayed on page 135, Plate 56, Color Sample E8. ↑ "Burgundy". Dictionary.com. Retrieved 24 April 2011. ↑ 1989, Oxford English Dictionary, 2nd ed., s.v. Burgundy. ↑ ISCC-NBS Dictionary of Color Names (1955)--Color Sample of Old Burgundy (color sample #47). 40x40px Look up burgundy in Wiktionary, the free dictionary.